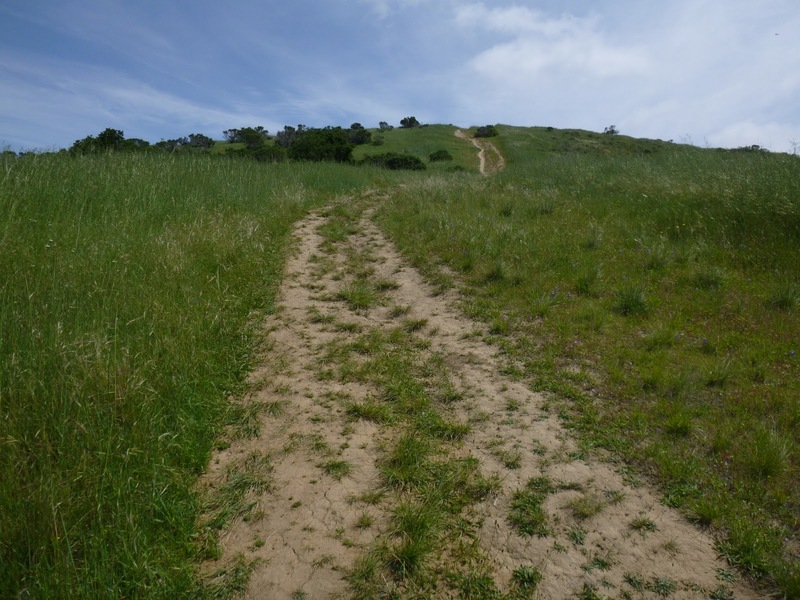 A long long time ago (maybe almost 20 years) I tried to hike at Sugarloaf Open Space, in San Mateo. Nothing was signed and there were paths everywhere -- I was a new hiker and so gave up and probably went to Edgewood instead. But this failure has been at the back of my mind, and on Saturday I decided to give it another go. Way back when we didn't have (many) websites or Google Maps, and strangely enough even today there is not very much Sugarloaf Open Space information available on-line (there is plenty describing and mapping Sugarloaf Ridge State Park in Sonoma as well as Sugarloaf in Walnut Creek). This Sugarloaf is small and surrounded by development, so you're not likely to get lost. Locals access the open space via several neighborhood trailheads; if you're arriving in a car I recommend starting at Laurelwood Park (park on the side of the street on Glendora Drive). Once past the adorable playground and nice bathrooms, a wide gated fire road heads south. This trail makes a promising start, climbing slightly though buckeyes and coast live oak along a seasonal creek. After less than 1/2 mile, there's a signed multiple junction, with a level trail heading right and two trails climbing to the left. I chose the second ascending trail and here the fun began. The wide trail climbs sharply through some mixed woods to a saddle and junction at 0.6 mile. The trails straight and to the right lead to the open space boundary. When I looked at my only other option here, my heart sank -- this is a crazy steep trail (more than a 26% grade in sections)! Up I went, huffing and puffing. Gorgeous lupines were blooming through the grassland and I stopped to take some photos and catch my breath. Finally the trail reached a junction and ridgeline at 0.8 mile. Here I turned right and was glad to stroll at an easier pace along the grassy ridge. There are lovely views in every direction from the hilltop and on my hike swallowtail and buckeye butterflies were drifting through the coyote brush-dotted grassland. The summit, at about 0.9 mile, sits at 586 feet. From here two trails head north (I can't vouch for them -- most maps show them as dead-ends). I headed back the way I came, making a quick detour to a bench off on the north slope of the hill -- nice views and a good rest stop. When I reached my intended return trail at 1.1 miles, I paused. I didn't relish descending another steep fire break. I noticed a more level path on the right and decided to check it out. After a short distance through grassland, I came upon a note tacked to the ground. "Please use new trail! -- trailcenter.org" OK! I didn't need much encouragement, figuring any new trail would be better than the old ones. I followed a few more notes (it was like a treasure hunt) and soon found the new trail at 1.2 miles. An old, closed route goes right -- new trail heads left. Score! 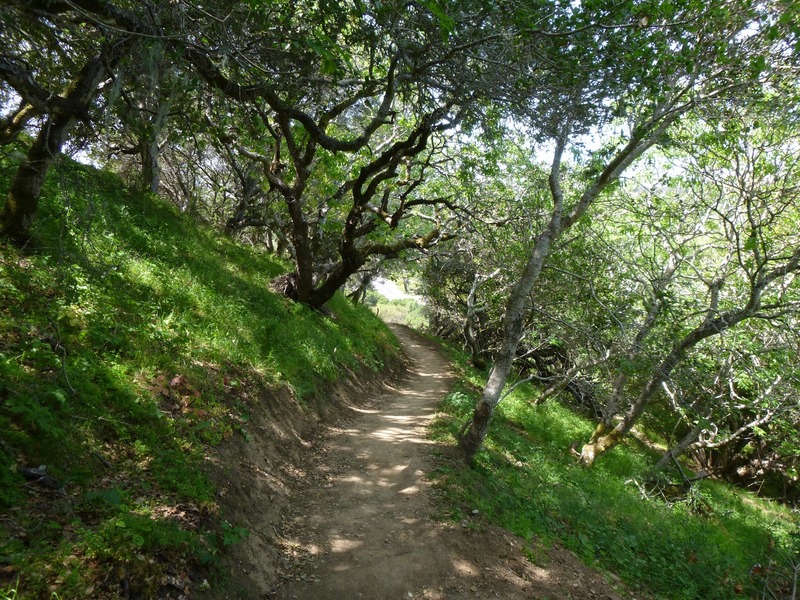 This lovely path winds through coast live oak and buckeye woods and patches of grassland and chaparral. Quite a few woodrat nests are visible, some right off the trail (a few in poison oak shrubs and and one up a tree). I saw many San Francisco collinsia (considered a rare species) as well remnants of late winter flowers larkspur, hound's tongue, and Indian warrior. Monkeyflower was blooming in sunny spots and soaproot was readying itself for a late Spring show. After an easy descent, the new trail ends at 1.9 miles, with Laurelwood Park and the trailhead a few steps to the left. Thanks Trail Center for your awesome path! Check out more photos from this hike here -- full BAHiker page coming soon.